Congratulations to "LS", "Maureen C." and "Bn100", the winners of Patricia's giveaway. Thank you to all who participated! Halloween is a special time of the year for me because I love all things that go bump in the night. Maybe that’s why I am so drawn to the dark side and I love writing and reading anything full of suspense and thrills. I’ve never been into horror or gore fests…more of the things that take your breath away or plots that allow your imagination to take flight. Sometimes…less is more. Take the movie Seven for example. There’s a scene where they show the viewer a photograph having to do with the sin ‘lust.’ You didn’t have to show me any more than that and I was successfully chilled, knowing what lay ahead—and I didn’t have to watch it. There are some other great thrillers out there such as Silence of the Lamb, White Noise and the like. Today’s day and age take the thrill out of using your imagination by trying to push the bar. So much blood and gore can take away from the plot and simply leave me less thrilled or chilled. I’ve visited several haunted houses and cornfields, and the best scares to me is the unexpected, the not knowing what is around the corner. It’s the anticipation, the buildup. The best haunted house I’ve been to to date, used darkness to their advantage. You literally had to feel your way down the hall as you couldn’t see a foot in front of your face. Sometimes the wall moved or something popped out of it when you touched it. My heart would race and a scream was sure to come. What fun! Next up? I’d love to visit a haunted prison or old sanitarium. I’ve passed on the love of Halloween to my kids. We started early on, well before they were old enough to appreciate a good haunt. 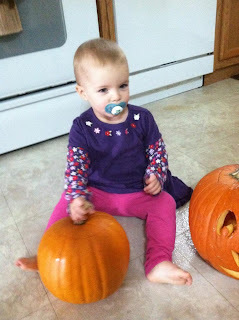 We carved pumpkins, watched Halloween movies, going to corn mazes and hayrides. Here’s a picture of my boys when they were very young, helping me carve pumpkins preparation of trick or treat. This year we pass along the fun to my granddaughter as she helps carve her first pumpkin. Whereas her daddy was ready to ‘bite’ right in, she, on the other hand, wasn’t having any of the gooey insides. As they grew up, they worked with us at a friend’s Corn Maize and haunt Scream Acres. My youngest loved being a monster and scaring those brave enough to venture through. He had the creepy scary down so well that he never failed to scare me…and I knew who he was. Creepy is scary, the unexpected is frightful…letting your imagination take over is the best scare of all. I frequently dream in nightmares. Some of which make it to my plots. I always ask myself when starting a book: What scares me? And oh…I have so many things that would take my breath away or have me running in the opposite direction. Add romance to the plots, and to me you have the perfect combination of intrigue and happily-ever-afters. My book Love You to Pieces is just such a combination. You have a villain so frightening, you fear ever running into him in an alley or nightclub…and you have the hero and heroine, struggling with their own pasts and obstacles, finding a love to conquer all others. Or do they? He stood quickly, grabbed her around the waist and slung her over his shoulder. She tried to resist, shifting and kicking, but his strength and her bound limbs stymied her efforts. He tossed her on the plastic-covered table, her head thumping against the Formica. The tape deadened her moan. She lay frozen, her nose now running along with her eyes. Smiling, he grasped the steel hacksaw and circled the table, passing the jagged edge gently across her flesh as she wiggled and squirmed. “Your hand?” He lightly sliced the wrist, leaving a trickle of blood, as the tape muffled her cry. “Your foot with its cute little toe ring?” He left another stinging hairline cut. Her ear boasted several small hoops running from the lobe up the cartilage. It might make a nice trophy to send back to her lover and certainly would make an attractive display all vacuumed-sealed in an airtight bag. Decision made, he placed the blade above the left ear and cleanly sawed through the flesh. Her screams barely penetrated the tape and her eyes rolled back in their sockets. Blood ran freely from the side of her head. He slapped her cheek a few times to keep her awake for the rest of the activities. Comment below and tell me what your favorite part of Halloween is. I am giving away an autographed paperback of Love You to Pieces to one lucky commenter. Two runners up will get their choice of an eBook copy of the book in either Kindle or NOOK formats (winner’s choice). Giveaway ends 11:59pm EST Oct. 31st. Please supply your email in the post. You may use spaces or full text for security. (ex. jsmith at gmail dot com) If you do not wish to supply your email, or have trouble posting, please email maureen@justromanticsuspense.com with a subject title of JRS GIVEAWAY to be entered in the current giveaway. My favorite part of Halloween is seeing how creative people get. I like seeing the haunted houses popping up on the street and of course the candies! I love Fall weather, but my favorite part about Halloween specifically is seeing all the costumes on the kiddos as they trick or treat. Good morning! Halloween is only a day away. I hope everyone is staying safe on the East coast from Sandy. My thoughts are with everyone on the coast. Thank you Cris, Na, and Kara C for taking the time and stopping by the blog. I appreciate it. Great things to love about Halloween--I'm a candy nut myself. Love the after holiday sales and cheap candy! We haven't seen any haunted houses popping up in our area--but would certainly love to see them! And Kara C, thanks for saying you can't wait to read my book--I apreciate that hope you like it if yuo get to read it! Thank you to all of you again--nice meeting you here at JustRomanticSuspense.com--I love this site! I love the thrill of things that go bump in the night, costumes and candy! Hi, bn100, LS, and Kimberly! Thanks so much for stopping by and spending Halloween with me. I appreciate you taking time out of your busy day to post. Thank you, LS--so glad to hear that you think my book sounds good! I do appreciate that! Have a great rest of your day! Susan.Bogert@Yahoo.com I had to stop reading after the ear part. Can't wait to get the book and have the time to read it straight through. I know once I start reading it I won't put it down. Oh, how gruesome...I hope he gets it tenfold back at him! I love watching the kids trick or treat. They are having so much fun, but the kids who don't do anything for a costume and expect candy just for showing up at your door tick me off a little! The chocolate candy and Smarties are also a wooooonderful part-lol. antonidis at aol dot com. Hi, Sue and AmyA! Thank you for stopping by and taking the time to read my blog post. I appreciate it! Sorry the excerpt was a bit gruesome--I usually don't bost those parts, but I made an exception for Halloween. :-) I do hope you like the book if you get a chance to read it! Oohh...I love Smarties. Just bought some for our trick and treaters. those and of course chocolates! Thank you again! I appreciate your time! Your book does sound chilling. It is a good time to bring it out! I love seeing the children in their costumes - it's especially fun when the parents are also in costume as they all go trick or treating. I love the stories and haunted houses that only show up around Halloween. I'm a psychological thriller fan. Blood & gore don't do it for me... but get my brain involved and I'm scaring the heck out of myself with all the ways things can go wrong. Great book excerpt. Look forward to reading it! Thank you for being here & the giveaway. It's the only time, I stock up on chocolate especially dark chocolate. Good morning! It appears I am a bit behind. thank you to: Janet, taurus, Jo, Erin, Kai, Ann Q, and LIBRARYLADY. I do appreciate all of you stopping by, reading my blog post and taking the time to comment! You guys are all great! Janet and Jo--thank you about my book. If you do get the chance to read it, I hope you like it! And Jo--I couldn't agree with you more about psychological thrillers! Taurus, Ann, Erin and LIBRARYLADY--children are the best part of Halloween with their costumes and smiles as they go from house to house trick or treating. Can't wait for tonight to pass out candy! Love it. Kai--got to love the dark chocolate...my favorite. I love Midnight Milky Ways! Yum! Thank you again to all of you for stopping by! Happy Halloween! My favorite part is giving out candy although this year Halloween was canceled because of the hurricane but since we got our power back today I think some kids will still come out. Hi, Colleen and Maureen! Happy Halloween. I just finshed handing out candy to the neighborhood kids...love the cute costumes! The cold, rainy weather kept us from getting a lot. But at least we had a few. I hope you guys both got to hand out candy as well. I think it was a bad year for trick or treat. Maureen, I do hope you survived the hurricane without any damage. Thanks to you both for taking the time to stop by!